Angelica is fun because she hasn't done a lot of Halloween stuff before, like make a jack o lantern or go to a haunted house. Plus, this is my first Halloween back from Japan, so we are doing some classic stuff that I haven't done in a while. It's been good times so far. We are planning on doing a haunted house tonight and then go to a costume party, so I will report on that later. We did a bit of costume shopping, which is pretty much the funnest sort of shopping that I can imagine. I'm happy that these Guy Fawkes costumes are still popular. Did you know that the word "guy" meaning "man" or "person" originates with Guy Fawkes? The interesting little entry in The Merriam-Webster New Book of Word Histories. We put our pumpkin outside one little day before we wanted to carve it, and the next time we checked it had been chewed up by squirrels. Angelica drew a face so that we could cut out the parts with the little teeth marks. I thought it came out pretty well. A fun thing about being back in the US after such a long time is I feel like a bit of a tourist even in my own hometown. There are a few interesting local spots in town that I've never had a chance to check out, and thats why we decided to go to the Cozy Dog Drive In. This little Springfield restaurant claims to be "the home of the famous hot dog on a stick". The story is in the true spirit of the American inventor. I might paraphrase the timeless story as "This guy saw this thing, and it sucked, so he made it better". You might want more details than that, though, so I humbly offer the tale as told by late founder Ed Waldmire, Jr. to his son Bob on January 30th, 1959. In Muskogee, Oklahoma, I saw an unusual sandwich called “corn-dog.” This sandwich was a wiener baked in cornbread. The corn-dog was very good, but took too long to prepare. The problem was how to cover a hotdog with batter and cook it in a short time. In the fall of 1941, I told this story to a fellow student at Knox College whose father was in the bakery business, and then gave it no further thought. Using cocktail forks for sticks, the U.S.O kitchen in which to experiment, we made a very tasty hotdog on a stick, that we called a “crusty cur.” They became very popular both at the U.S.O. in town, and at the P.X. on the airfield. My friend continued to send mix and we continued to sell thousands of crusty curs until I was discharged – honorably – in the spring of 1946. Cozy Dogs were officially Launched at the Lake Springfield Beach House on June 16th, 1946. This story and a bit of additional history and news is available on the Cozy Dog website here. Apparently Cozy Dog was also featured in National Geographic's Traveler magazine, but the magazine's website guards its treasures a bit too jealously for this lover of truth. And here's the magical food people come here for. It's the only place I know of where you can get a good corn dog when the State Fair isn't in town. I think this little eatery would be pretty cool even without its claims of corn dog genesis. The restaurant sits on Historic Route 66, the old-school patchwork of roads that led from Chicago to Los Angeles before the advent of the Interstate Highway System. It has lots of memorabilia everywhere that was interesting to look at while I waited for my food. It's the only restaurant I can think of that has a library available to customers. They have a few cases of souvenirs, mostly involving Route 66 and/or anthropomorphic hot dogs. If you want to be cool and experience some quality Midwestern culture, head to Cozy Dog Drive In and look for the sign with the giant embracing corn dog people. The winner of the Uprinting.com 250 Business Card Giveaway is.... Angelica! Enjoy! Thank you to everyone who entered. When we left them, intrepid travelers John and Angelica had completed their journey on PeruRail and were weaving their way back and forth up the side of a mountain by bus. I figured it would be wise to have a bathroom break before entering, and even that was interesting. There was an attendant accepting 1 sol per person to use the facilities. Fine, be that way. The good part was that I was given a receipt for this 30cent transaction. My toilet paperwork is dated, has a serial number, is itemized, and even has a little "thank you for choosing us" at the bottom. Golden! Machu Picchu is the most famous remnant of the Inca Empire. Nearby Cusco was the capital of the empire, but Machu Picchu's obscure location left it undiscovered and so undisturbed by Spanish conquerors. I can't find a straight answer on the purpose of Machu Picchu, and that's because all we have are theories. There are no surviving examples of an Inca writing system. Some important advice I'll give to anyone out there considering a trip to Machu Picchu: buy a guidebook! The little, few page brochure provided at the ticket gate is really weak. Only after returning to civilization and reading about it online do I have any idea what I saw out there. I might suggest joining a tour, but two or three of the English-speaking guides I eavesdropped on didn't impress me. Buy a book about Machu Picchu. You will have plenty of time to read it on the way up. There's a cool exploratory quality about Machu Picchu that I don't think I've found anywhere else. It's a bit like walking around in a Tomb Raider video game. The whole place is a multilevel series of very narrow terraces. Often the way to the next terrace isn't apparent, especially when going downhill. Here's a good example of that. This little rock staircase juts out from the wall just enough so that it's difficult to see until you are standing right over it. These alpacas were tagged and probably not wild, but it was still fun seeing them walking around the ruins. Machu Picchu had a few staff doing various things. This poor guy's job was blowing a whistle at people who weren't obeying the rules. He was far up on a perch, so I doubt if the offenders even knew they were being scolded. Speaking of scolds, I have another little bit of advice: bring plenty of water and a snack. The literature states that only water brought in a canteen is allowed inside the park, and I believe food was outlawed outright. Before entering there are a few small opportunities to buy food and water, but they are supremely overpriced. Inside Machu Picchu there is nothing. I'm usually one for following the rules, but this rule is a bit too strict, and enforcement seems to be close to zero. I saw water bottles and sandwiches all over the place. Just be a good person and don't litter and I don't think anyone will mind. Angelica with one of the workers. Up this high, there wasn't much wildlife to be seen. I was surprised to see a bunch of lizards running between the rocks. There didn't seem to be many bugs around for them to eat. The Intihuatana is some kind of clock or calendar. It is believed to tie the sun to the earth. One section of the little city was in ruins. I wondered why this area was so bad while everywhere else looked so good. I would be interested to see how much restoration has gone into Machu Picchu over the years. Did the whole place previously look like this and has been rebuilt? Then the stone work itself raised a question or two. Why is the quality so uneven in places? Did the good stuff stay up while the bad stuff has been reassembled by modern hands? Another example of a wall that seems to have two different levels of workmanship. The bus fares for the trip back to Aguas Calientes. Fair or not, fees for things in Peru were often different for nationals and non-nationals. The rates span $7 one way for adult foreigners down to $2.60 for a child national. The police station back in town had a cool coat of arms. These are electrical boxes for a nearby produce market. The yellow stickers are notices from the electric company about failure to pay bills. The next day we saw more ruins, met more people, and took many more pictures. Don't forget to enter to win a free block of custom business cards. You aren't signing up for anything and there's no strings attached. Just free cards for your business or amusement. Check it out here! 250 Free Business Cards Giveaway! I'm excited to announce JMAA's first prize giveaway! 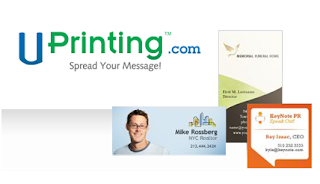 Up for grabs is a block of 250 business cards printed custom for you by the good people at Uprinting.com. Free business cards, free shipping, free.... bubble wrap? Free UPS Ground Shipping in the USA. Canadian Residents must pay shipping and taxes. Residents of other countries are not eligible. To avoid looking shady, this drawing is not open to family members. Sorry!! I mean, the best gift of all is a smile on my loyal readers' faces, but I get my own set of 250 cards just for hosting the contest. I'll probably use them to promote my blog. If everyone seems to like this sort of thing I will do more in the future. Good luck!